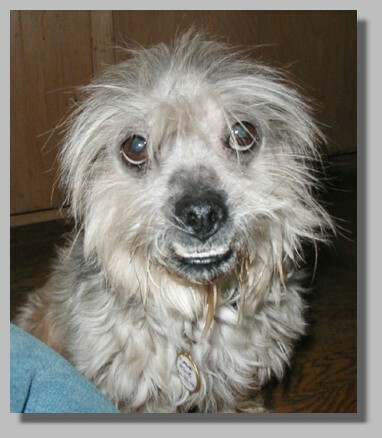 I am an ugly duckling, but I am working on becoming a happy, healthy, affectionate dog. I need someone to help me a become a GREAT dog. I had a rough start and wound up in a California shelter almost starved to death this winter. 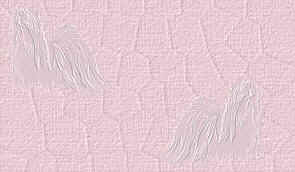 I was pitiful, all skin and bones...My hair was almost all gone, I was covered with sores and looked awful, I know. I itched all the time. No one wanted me cause I was not a pretty dog. I was very lucky though. Someone took an interest in me and got me into rescue so I wouldn't die. I was able to get a ride with some other rescues all the way to Washington just a few weeks ago since the person knew that Furbaby Rescue would take care of me. I was sooooooooo skinny when I came to my foster home, I wanted to eat EVERYTHING at once. My foster mom knew that wouldn't be good for me, so she fed me small meals, 4 or 5 times a day. I can be protective of my food at times, with other dogs or even a person...it's 'cause I am not yet sure there will be food for me ever again. My foster home is working on housetraining, I use the doggy door almost all the time, but I still have a accident now and then, if its closed. I need someone to help me with that. I was a very good boy when I visited the vet, let him look and feel everywhere without a fuss. My foster mom bathes and brushes me every two days now since my skin is still healing, I'm very good then too! I have pretty good manners now..I can walk on a leash, I know my name, I am OK sleeping in my crate (but I'd love to share yours! )...I get along great with all the other small dogs at my foster home. I even started carrying toys around and playing with them! I wag my tail now and stand for treats, it sure is nicer than being a stray or in a shelter. But I want my OWN home now...is it yours? If you have some love to give, experience to teach me with and time to spend together...I will be a bestest best friend. 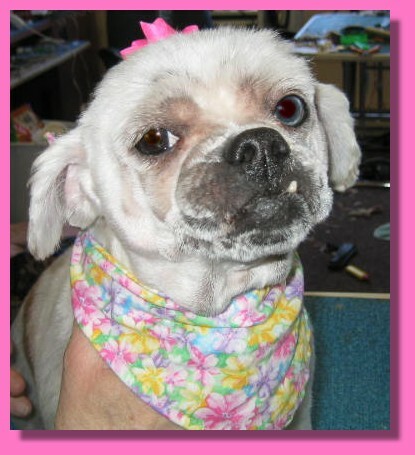 "Adorable, and sweet Morgan passed to the bridge, Dec.30/08 after a lengthy illness...you are so missed lil one"
I am Morgan and I am 10 inches tall ,weigh 15 lbs and approximately 5 years old. My fur is like snow, my eyes reflect the summer sky and I can bark like a Rottweiler. My spirit is the sweetest and my love is endless. Well, that's the stuff my foster mom tells me. What I like to say about myself is that I can win any staring contest and I love to eat...everything. That's why I was dumped at a shelter and left to die. My family gave me all the junk to eat and I got sick and started smelling bad. My skin was scaly and itchy and my eyes and ears were infected. And all this because they did not have enough love to say no. I am a ruthless beggar and I need boundaries (says foster mom). I am all better now. I even had my teeth cleaned and my ears flushed out. Now I can hear foster mom say 'no' much better and she says it a lot. She makes me eat DOG FOOD. But at least she lets me eat all the raw fruits and vegetables I want. And I like them all! I love car rides, walks and play time with people, little dogs and with stuffed toys. No big dogs please and no little kids. But I tell you a secret. I adore men and will make friends with them easy. It's because I miss my Dad. But I love women too like my foster mom and my neighbors and Eleni. (She said 'no' too a lot). I would love to have a doggie friend. I get very depressed when I am left alone for extended periods of time and that's why I need a brother or sister. I will keep you warm at night while I snuggle with you under the covers and in the morning I nudge you gently, because it's time for breakfast. Are you out there? The family who will love me enough to keep me healthy and love me forever? Because I am ready to love you! Ziggy's Dad is dying of Cancer, and is in hospice, and was no longer able to care for his friend. Ziggy needs a new home, he always just lived with his Dad, but he can live with a woman, and other dogs, Ziggy has a bit of tude, probably because his elderly Dad, never gave him any boundaries, normally if you just tell him to "cut it out" he listens...he would do best with someone who understands Lhasa..presently fostered in Seattle, WA contact Furbaby for more information. *NOTE: (Feb. 21/04)Ziggy was taken to the vet, as the foster Mom felt something was not right, we at this time are waiting for results, we have found that he does have a heart murmur, and there is a possibility of either Addison's or Cushings, will update as we know more information...please keep this boy in your prayers. His attitude has been cranky, but hard to determine if his illness causes this or this is who is, not knowing him ever as a healthy dog. Nov/04: Ziggy still is very underweight, he is happy though, he loves his forever foster Mom, and has bonded with her....he gets lots of extra treats, and special food, to try and keep weight on him...what time this baby has, we don't know, but will continue to help him the best we can. Also he has a heart murmur, and is on heart medication. Jan/05: Ziggy is a having a very difficult time, keeping any weight on, he is very thin, he is also starting to lose some balance...his foster Mom, is giving him all that he can eat and more, and helping him with love, and excellent medical care, she fears he may not have much time left...foster Mom has bonded very deeply with this boy, and he is very bonded with her. We hope his time is not soon, as he is not "just" a foster, he wormed his way into her heart, and he is her dog. Feb.11/05: Ziggy was having a difficult day, losing his balance, and refusing to eat. He laid down on his bed, and closed his eyes for the last time, he passed quietly to the Bridge. We have no idea how long Ziggy had Cushings, but he had one more year in which he was happy, and loved...have a safe journey lil one, and I hope that Ralph is there waiting for you. Owen Williams, Vancouver, B.C. Canada "in memory of the late owner of Ziggy"
Benji is thrilled with any attention, smart and playful, throwing toys about or romping at your feet. He will dance and beg for treats, just to show you that he can. His energy and eagerness might overwhelm children, so an adult home would be best for him. Benji can be very sensitive, he cowers thinking he will be punished for something, probably remembering a not so great past, but he is positive and happy. He springs up onto your lap and wiggles to give you kisses and attention, licking your face and ears. He loves sleeping on a bed with his person and snuggling on a couch or chair. 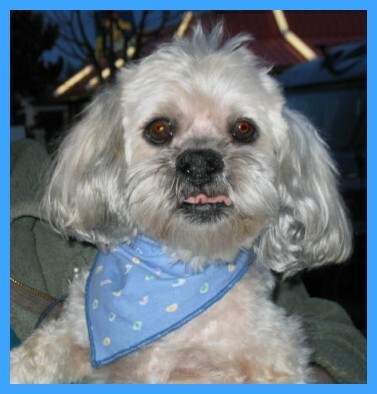 Benji would be VERY happy with another friendly small dog as a playmate. 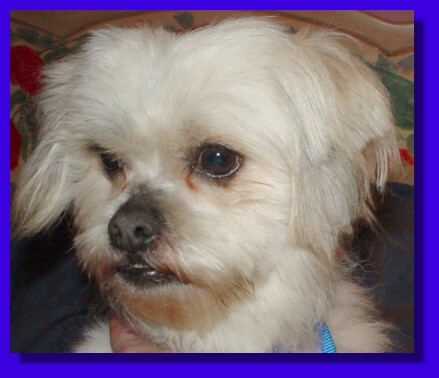 Benji can jump and climb so he will need a home that will keep him safe, inside as well when going outside. Benji is working on his rehousetraining and uses a doggy door with few mishaps. This training needs to be continued with love and encouragement. He will try to go exploring if he can wiggle under a fence or get thru a crack...so the secure yard is a must. 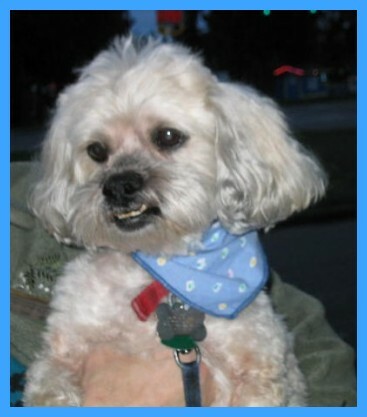 This little fellow has a wonderful new life, with a great Dad in Salt Spring Island, B.C. Tricot is an energetic dog who would love someone to play with, and exercise with, she can jump like only a poodle can.. I am one handsome boy, I am 4 years old, and weigh 24 lbs, not fat, just a sturdy boy. My Mom died, and Dad went away, and now I need a new loving home. Once you get to know me, you will love me, I am devoted, love to be with you, ADORE car rides, so excited when I see a leash. I will play with other dogs. I have a good sense of humor, and I smile when I am happy. Coca went through a bit of a depression when he first came, he was confused. I found just letting him be, he came around so quickly, wanting to join in, and belong. 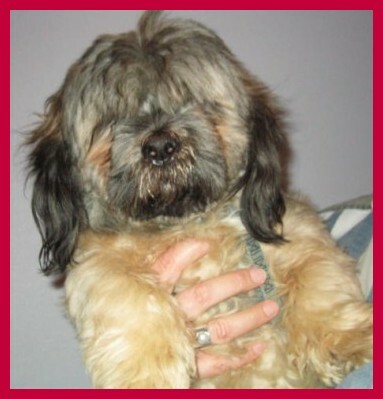 I love this boy, he has all the attributes of a great Lhasa, intelligence, gaiety, dedication, along with the normal stubbornness, all things that endear this foster home. "Adult Home Only and Lhasa Experienced "
Hi, my name is Nicky, and if you think I am gorgeous in my picture, you ought to see me in real life, even more beautiful. My Dad was a wonderful loving parent, he loved me so much, he decided to try and find a new home for me, you see Dad is elderly, and he worried that if something happened to him, I would be left alone, or worse put into a shelter, and he knew I would not do well...he wanted me to be safe and loved. I am a very loving dog, I get along with other small dogs, and I love to cuddle on the couch, and join you on the bed. I have had a good life, and my Dad was the best. I miss him a lot, but my foster Mom says, there will be someone to take away my loss, and fill me with love again. I have been to obedience training, have good manners, I am housetrained, and I am loving....but (there is always one isn't there) I tend to be food aggressive, so don't be messing with my bowl, and if I get scared I could snap...so if you take it easy with me, let me gain your trust, and willing to understand my short fuse, and work through this with me, I can be a great companion...I love carrides, I love being with you...I am independent at times. *Nicky was adopted for a week, by a really good home, but they realized quickly, that Nicky needs someone more experienced with his attitude. He has a startle reflex, and also will act out ..Nicky is doing very well in my home, learning how to relate to a pack, and not being #1...he just needs the right home, with experience.